Lusaka, Zambia, 12th December 2017 – It has come to our attention that in his quest to score cheaply and in his usual style bent on cheap populism, NDC’s Chishimba Kambwili posts to his Facebook wall alleging that the Media Department’s Social Media Administrator’s Consultative Meeting had Government Officials and was paid for by the State. 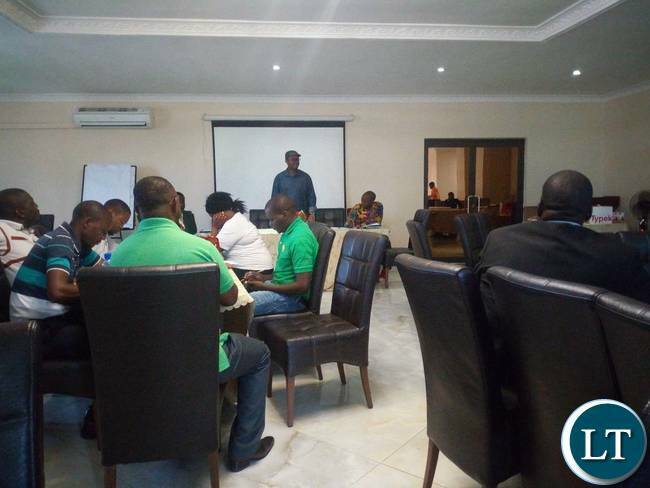 He thereafter seeks to connect the meeting to the regrettable disturbances at the Copperbelt University, when the two are not related in any way. As a habit, he has no restraint when it comes to racing to the bottom and it is not our intention to compete with him on that score. 1.Social Media is new media and we shall build the capacity of the Party’s communication infrastructure without any apologies to the NDC leader. 2.The Copperbelt Social Media Administrators meeting was NEVER attended by any single Government official. Government officials attending the meeting only exist in the NDC leader’s world of imagination. While an invitation had been extended to Mr. Amos Chanda, but apologies were made as he had other commitments. 4.The Social Media Consultative meeting was not funded by any Government department but the Patriotic Front Media Department. For the NDC leader’s benefit, this was the second meeting to be held on the Copperbelt while several others have been held in Lusaka Province. Instead of the NDC leader majoring in majors, he finds it easy to major in minors. We therefore wish to advise the NDC leader to reflect on what former US President Barack Obama called “snap judgements to complex issues” when it comes to social media. Attempting to over-simplify the unfortunate incidents at the Copperbelt University is a clear case of NDC leader minimizing the maximum and maximizing the minimums. We refuse therefore, to join him in his race to the bottom. One thing he knows however is that a mobilized and highly effective PF Media will shorten his lies’ legs even further. He knows that an organized social media team will be a nightmare for him as it will cut his lies to size in real time. Muuzeni Kambwili! Too talkative for nothing. One wonders how he even got his doctorate degree. On a serious note though, then what did Kambwili’s complaints about this meeting got to do with gvt resolving the CBU crisis if indeed this meeting is not a government meeting? The opposition should make sense, not just making noise by trying to connect wires with cotton. Seriously I wouldn’t be moved by a leader who’s misusing simple logic. Must one speak just to be heard even when they are not making sense? We need a serious opposition. Kambwili is a cheap and crueless politician,therefore just ignore him!! Kambwili is any empty tin making noise in a big room.many Zambians see no difference between Kambwili and Chilufya Tayali!!! CK will only shut his big mouth in 2021 after being taught a political lesson by PF.for now let him continue dreaming because DREAMS ARE FREE! !CK thinks Zambia is Roan constituency!! !if it took a famous and political Giant Michael Sata 10 years in opposition,who is Kambwili to think that he can win the presidency on NDC in 2021?DREAM ON CK!! what was the workshop all about, activating or deactivating phones? @Njimbu why do you hate Kambwili so much? Your comments on him are always off the curf, PF are now desperate and using govn’t money to organise useless workshops that won’t take them anywhere, my friend things have changed and I can assure you PF will sweat in 2021. Continue living in denial we were also staunch PF supporters but no more because of ECL’s poor leadership. Zweeeeee kambiwili is up to the point. Is there anything this childish party will not respond to??? Should they keep quiet so that HH and Pilato continue mocking them? Just imagine!!! By the way where was this sunday or is he monday Chanda, when PF was fighting mmd?Stop abusing the name CHANDA this is a very important name in my family!! Its funny you say this from rock bottom yourself. upendi and pf is just same coin. head and tail just depends how you flic it. Thanks ba honourable CK, you have touched them where it hurts, You have been in there and you know how they operate, thanks for sharing sir. We take it these are the kicks of a dying horse. Can’t wait for 2021 to get rid of these corrupt men and women who are killing Zambians by their selfishness. There is time for everything. So Amos was invited in what capacity? Empty buckets make the loudest noise. How I wished it was organised noise like Jk’s music I would have enjoyed dancing to it. Sunday Chanda’s survival is making comments unnecessarily so that his boss can buy him beans and pamela.